Sorry for the week of silence. I was out of the office to visit my parents before the semester started. 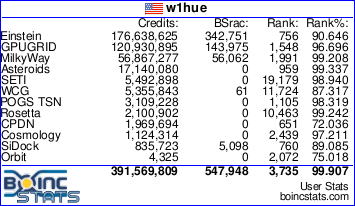 It may be a server issue, but updating the boinc libraries in the client code (the program running on your computers) won't change anything on the server. I've already updated the server libraries and that didn't help. Anyway, I am going to work on compiling all of the binaries today. Hopefully there will be a new version of MilkyWay@home put out by the end of tomorrow or Wednesday. Message 65078 - Posted: 29 Aug 2016, 16:10:17 UTC - in response to Message 65076. I've already updated the server libraries and that didn't help. 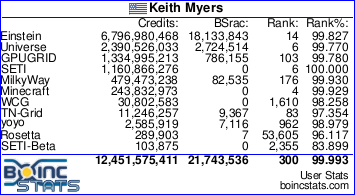 Do you think to contact D. Anderson and the Boinc devs team for have an help? I have been number crunching for awhile. I'd like to comment a few aspects about this erroneous bug hunting that I've seen lacking in the past. Have people actually looked inside their computer lately? Its a good idea to re slot your graphics cards, and CPU's every so often say 6 monthly or 12 monthly intervals. The heat sink compound found interfacing chips with heat sinks degrade (dry out) depending on what grade of compound used, indicated by the tone of dye. Even the chips with heat sink tape degrade their ability to transfer heat from the chips to the heat sinks. When number crunching the chips are stressed more or just as much as those high resolution games so its good practise to be of high maintenance with your number crunching rigs. And please try and understand that no matter wether it is AMD ATI or NVIDIA the graphics card generally live 5 years. All modern facilities that make computer peripherals base their products lifetime of 5 years in an office environment. Perhaps if people considered my comments and went over their equipment it would be more ethical and robust in bug tracking. Message 65081 - Posted: 30 Aug 2016, 14:40:25 UTC - in response to Message 65080. Hello Jake, thanks for hunting the bugs. For the GPU dection issu, is suggest you contact Einstein@home, they never had issues with the GPU detection in my opinion. And AMD GPUS work very well there with OpenCL. Message 65084 - Posted: 31 Aug 2016, 15:18:46 UTC - in response to Message 65083. I've always gotten the impression that if you want to crunch for MilkyWay, it is best to run Nvidia cards because they never have any issues. Either completing and validating work nor getting detected properly by the project. You take your chances with any kind of AMD card on the other hand. I have had 400, 600, 900 and 1000 series cards now working for MW with not one issue, ever. I run 3 Computers with NVIDIA Graphicadapers, till now no problem with the Software here. Ran into a little snag getting the new BOINC libraries cross compiling for windows. Will hopefully have it all figured out by the end of the week for a Monday release. Message 65087 - Posted: 1 Sep 2016, 4:00:05 UTC - in response to Message 65083. Those fans are mostly crap to begin with. . . and more like impossible to find! No problem here with NVIDIA cards being recognized -- I have used five different ones so far. The latest are: GT 730, GTX 750Ti and GT 610 (in a low-profile machine). The problem with Nvidia Cards is, that they have almost no Double Precision crunching power except for The GTX Titan or Titan Black (both Kepler). I also had some driver issues with my Titan Blacks, when the cuda version was updated and a bug was in that version. Your Titans can do quite well on Milkyway. If you want to run it a little, you have to set in the driver that double precision is used. And you have to use the app_config file to run 6 to 8 workunits in parallel per card to get them fully loaded. Message 65089 - Posted: 1 Sep 2016, 12:38:50 UTC - in response to Message 65087. No problem here with NVIDIA cards being recognized -- I have used five different ones so far. That's the point. Boinc manager recognizes my Amd gpu (and i crunch on Poem, Seti, Einstein, etc), but MW@H not recognizes it. Message 65090 - Posted: 1 Sep 2016, 15:35:52 UTC - in response to Message 65086. No problem. You are working well! Don't know if it counts as a "GPU issue", but I have noticed there is a shortage of GPU workunits again. When BOINC requests new work, plenty of times I get "0 new tasks" and the queue quickly goes empty. Admittedly, I have 4x7970 and they need a lot of workunits for continuous crunching. Message 65092 - Posted: 1 Sep 2016, 19:10:39 UTC - in response to Message 65088. Message 65093 - Posted: 1 Sep 2016, 19:55:33 UTC - in response to Message 65088. Oh I realize the Nvidia consumer cards are very hamstrung with respect to their Double Precision compute power. They are good enough to run MW if you also run multiple other projects that don't require Double Precision. If you want to run a single project that requires Double Precision, then an AMD card is your obvious choice to get maximum efficiency and RAC. I suppose then you have the will to constantly fight the driver compatibility issues with OS' and projects. I don't like to work that hard. Message 65094 - Posted: 1 Sep 2016, 20:04:24 UTC - in response to Message 65093. Indeed. And moreover recent AMD have less double precision capacity than old ones. I was really surprised to decrease my Milky power by almost 4 when passing from a HD 7950 to a R9 380. All is working fine for me, except the number of available tasks. Message 65095 - Posted: 1 Sep 2016, 21:19:37 UTC - in response to Message 65094. I forgot : on the R9 380, I needed to add a app_info.xml in order to recognize the card, and a app_config.xml to compute 4 tasks simultaneously. Hey everyone, i set up a HD 5970 (Dual 5870 on one card). I installed the newest not beta driver on it, and it runs smoothly. If you have such cards (HD 5850 or 5870) then you can use them without troubel for MW. Yep, i agree to your last post. Most projects only have a few persons, even students working on it (programming, maintaining server) so that only for one GPU brand is optimized. You have to pick your cards depending on what projects you like most. A GTX Titan black has 1700 Gigaflop of double precision power, but it can barely compare to a 7970 with 1000 Gigaflop here in Milkyway. Primegrid is the other way around. Hi all. Just recently started crunching again for my favorite projects. Years and years ago I used Radeon HD 38xx and 48xx (if memory serves lol) and got work for my GPUs from MW@home and they tore through it quickly. I have an R9 Fury now I was wanting it to do work with here and it doesn't receive work for Milkyway. I had kinda skimmed through a few threads the last couple of days looking for an answer and thought this was a good spot to ask. SETI, COllatz, ect. all receive GPU work with it. Thanks all for any help ! Message 65098 - Posted: 3 Sep 2016, 4:06:40 UTC - in response to Message 65096. I primarily work for Seti since that is my first distributed computing project I got involved with back in 2001 with OS/2 Warp. Single precision works fine there. I know exactly what you mean about the programming minefield that is OpenCL. I follow the threads of the main Seti OpenCL app volunteer developer and it is incredible the amount of workarounds he has to employ to support all the generations of video cards going back ten years just to get OpenCL to work on Seti. Things get incredibly more difficult with each new generation of hardware. Every new app is done by volunteer developers now since there is no funding for the project scientists anymore. We crunchers are very grateful for their hard work.